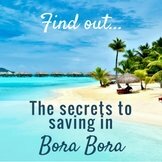 Are you wondering if there are any Bora Bora affordable resorts? You've seen photos of luxury hotels on white sand beaches with over water bungalows hovering above an incredibly blue lagoon. 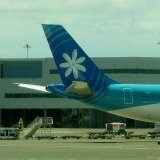 You've heard the long list of 'rich and famous' who fly their private jets to Bora Bora's motu airport. 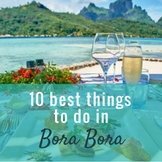 On the Bora Bora map you'll see that the Sofitel is on the main island. There's a variety of food choices within a 15 minute walk so you'll be able to keep your food costs down. 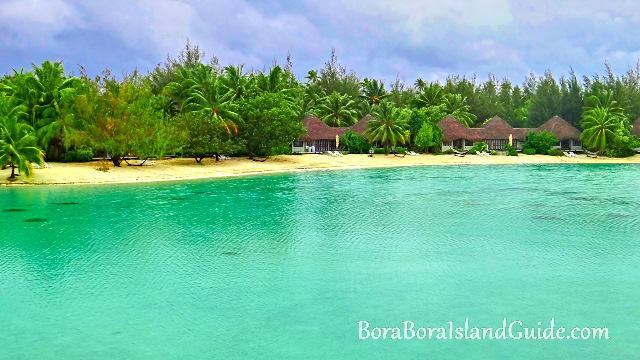 The Sofitel Bora Bora has a gorgeous swimming pool, bar and restaurant area with wonderful lagoon views. 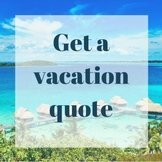 You can loll about on it's beach or whiz across to the Private Island and go snorkeling in the 'aquarium' coral gardens, without having to pay for lagoon excursions. 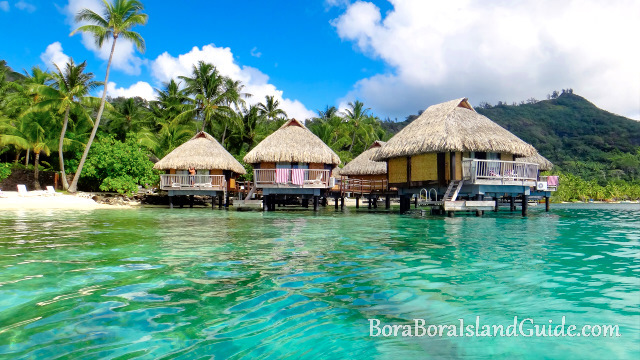 If you're planning a honeymoon in Bora Bora we suggest you pay a little extra and choose a beach bungalow at one of the more affordable Bora Bora hotels. 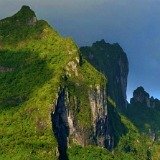 Do you want to laze under a palm on a sandy beach with a perfect view of Mt Otemanu? Or say your wedding vows at a quaint little chapel with a memorable lagoon vista? 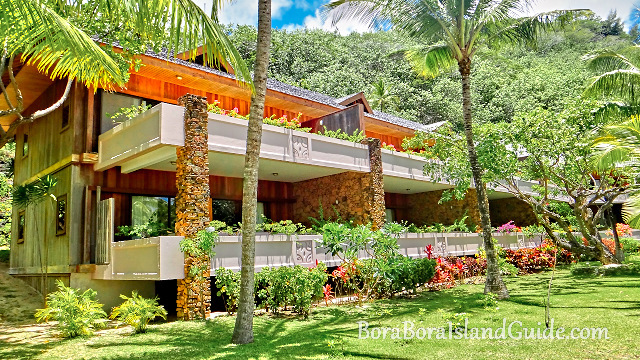 Bora Bora Le Meridian might be for you. This resort made us feel so welcome and the beach bungalows are very private. 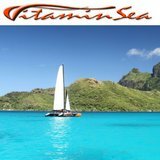 Dining at it's restaurants, with expansive views across the blue lagoon to Bora Bora Island is a surreal experience. It's even better than pictures can show. 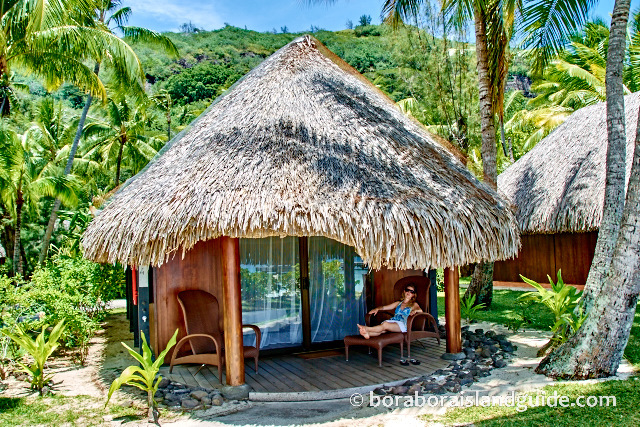 We also have a soft spot for romantic Le Moana Bora Bora. 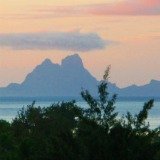 Read about our holiday in a beach bungalow at Le Moana and you'll understand why we have such special memories. 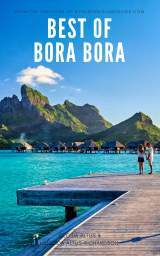 Stay at this Bora Bora affordable resort and you can also enjoy easy access to the luxurious Intercontinental Resort & Thalasso Spa on a motu. 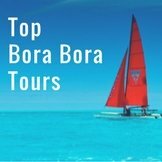 We suggest you catch the free shuttle boat to the best breakfast in Bora Bora and have the cost included in your accommodation package. 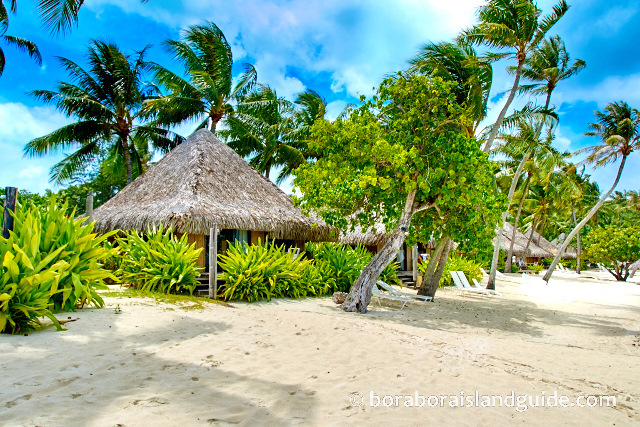 The Bora Bora Pearl Beach Resort has beach front bungalows with a charming island décor. The view across the blue lagoon to the legendary Valley of the Kings on Bora Bora Island is awesome. 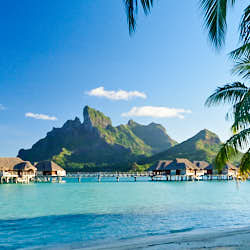 Bora Bora Pearl Beach was voted 5th most popular resort in the South Pacific. We had a wonderful time at the Pearl and didn't want to leave. It's Manea spa integrates feng shui principles with Polynesian design. The magical combination invites such deep relaxation that I fell asleep having a treatment. 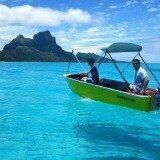 Watch for Hilton Bora Bora Nui Resort Spa affordable packages. We snapped up a special for 6 nights in a Hilton Nui Lagoon View Suite. This is the only resort (apart from the Maitai) with this style of accommodation. 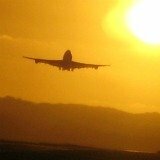 The deal included full board and airport transfers. 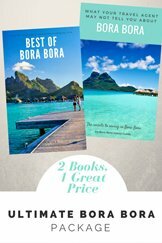 I'd never seen such affordable Bora Bora vacations on offer at a 5 star hotel. We arrived at the end of a busy time and the Lagoon View Suites were full the first night, so reception up-graded us. Each day we walked past the two story block of 12 Suites to get to our gorgeous Hillside Villa. So we arranged a visit, to compare a suite to a villa. The suite had a spacious layout, similar to our villa and had the same enormous, marble bathroom, with spa bath for two. There were actually some advantages, like being closer to the restaurants, beach and pier. And it had a better view of the lagoon. We would have been equally happy in one of these. 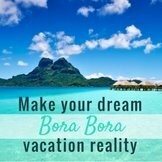 It is possible to find 5 tiare Bora Bora affordable resorts. The big spenders are helping to keep the amenities and grounds spectacular for you. 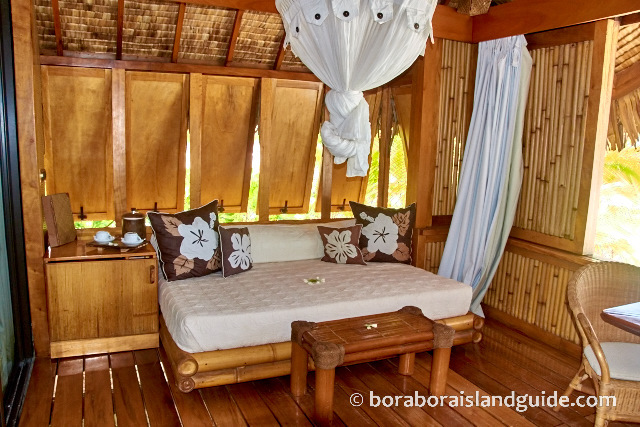 The Maitai's traditional over water bungalows are the smallest and cheapest in Bora Bora. 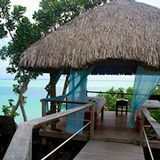 Sleep 2 nights (this way you have a whole day to relax) in an over water bungalow and move on land for the rest of your stay. 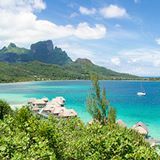 watch for special deals on over water at the Sofitel Private Island, Le Meridien, or Le Moana. 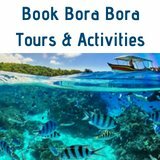 Now that you know how to find Bora Bora affordable resorts, see tips for having affordable Bora Bora vacations.